The owner of the site and lone contributor at this point. 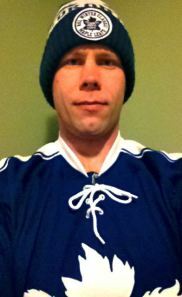 I’m a 31 year old sports fan living in Medicine Hat, Alberta. I am a former radio sportscaster who did colour commentary on junior hockey broadcasts in Northern Alberta back in 2004-2005. I have my Broadcast Journalism Diploma and had originally dreamed of becoming an anchor on TSN, but realized after growing up accustomed to small town Saskatchewan life, that the big city life probably wasn’t for me and wanted to be closer to home, so I left my broadcasting job and moved to Medicine Hat in 2005. I wasn’t able to land another broadcasting job right when I got here and pursued other options. When I moved to Medicine Hat, I started Boxing shortly after and had an amateur career than spanned 3 years and 10 fights, having fought some very skilled opponents including the Saskatchewan Provincial champ in the heavyweight weight class twice. I grew up playing hockey my whole life and played some competitive Senior Hockey in Saskatchewan for 2 separate season and separate teams. I have also been active in Recreation Hockey, Baseball, Slo-Pitch and Volleyball leagues to varying degrees. I haven’t been able to get as many golf games in as I’d like, but get out when I can. I enjoy watching the local MMA scene, but have no desire to compete in it as my competitive interest remains with Boxing even though I have been retired for a few years now. I played High School basketball for a season and did play by play, colour, camera work, directing, and story reporting and editing for a college basketball team while I was in college. I played lots of Baseball growing up in Leader and started playing with the Senior team when I was 15. I even played some Fast Pitch for a season when I worked at a small town Saskatchewan radio station after college. My favourite sports teams include the Saskatchewan Roughriders, Toronto Maple Leafs, Toronto Blue Jays, Toronto Raptors and the San Francisco 49ers basically ranked in level of interest. I have written for hockeysfuture.com as a junior hockey writer in the past and have also contributed articles to larry-fisher.com, a college buddy of mines site who took print journalism while I took broadcasting at LCC. Larry is now writing mainy for thehockeywriters.com. I hope you enjoy my page, I will try to put some time into making it decent when I have some spare time in my busy life.